Increase the functionality of your LIFEBOOK T Series Tablet PC by putting it into a case that lets you work easily, anywhere. 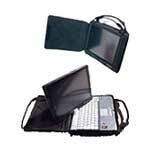 The computer is securely held in the case with elastic straps and the zip around enclosure allows you to fully open the case giving you complete access to your computer in tablet and notebook mode. Heavy duty elastic straps on the bottom of the case give you a firm hold while standing and operating your computer. Made from sturdy ballistic nylon. IMPORTANT NOTE: This case was designed for use in everyday situations. Although it can be used outdoors in tablet mode, it is not designed for use in environments in which there is excessive dust or moisture. All buttons and ports are easily accessible when the case is used in tablet mode, making it susceptible to liquid or dust contamination. If you would prefer a carrying case that is designed for use in more environmentally-challenging locations, please order Convertible Bump Case #FPCCC147. Features include: handles, openings for port access, adjustable shoulder strap, and a heavy duty elastic hand strap. 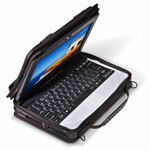 Note: Turn your LIFEBOOK T Series Tablet PC off completely before closing the case for storage or transportation. Do not use your LIFEBOOK T Series Tablet PC in extreme heat or harsh environments. Please see your manual for details.